Working hours: 8 a.m. - 8 p.m. 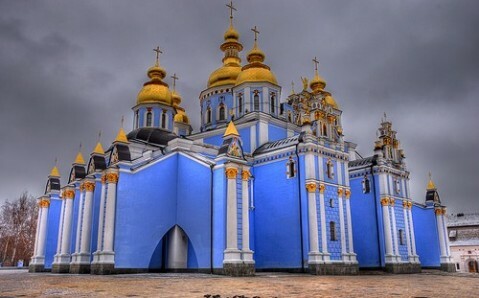 The sky-blue St. Michael's Cathedral, with its fabulously shining domes, is one of the most beautiful and important Orthodox temples in Ukraine. 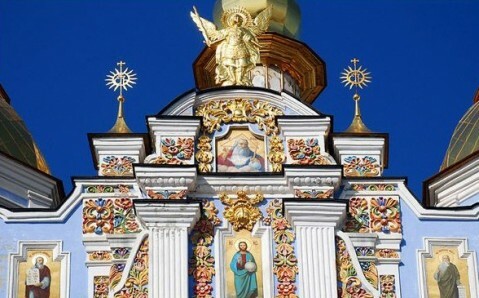 Built in the 90s, it is a remake of the destroyed St. Michael's Cathedral, which stood on the territory of the oldest monastery of Kyivan Rus for over eight centuries. The grandson of Yaroslav the Wise, Prince Sviatopolk, founded the cathedral in the early 12th century. 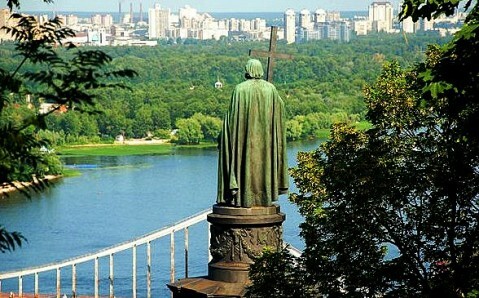 It is named in honor of St. Michael - the protector of Kyiv. 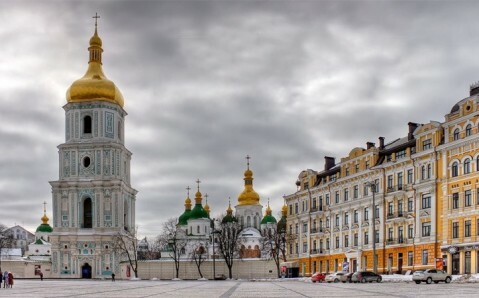 Its nickname, the Golden-Domed Cathedral, comes from the fact that was is the first and only church with such extravagant domes in ancient Rus. Byzantine master architects participated in the Cathedral’s construction. Yet elements of Ukrainian architectural style also come through clearly. At the same time the cathedral was built, smaller buildings also sprung up around it. 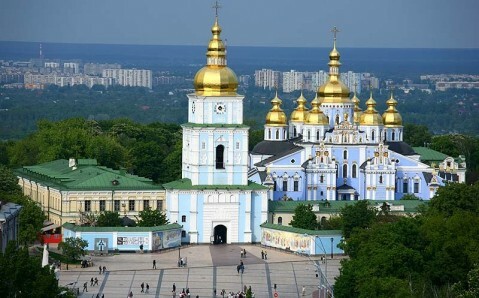 The church became the most honored religious monument among the residents of Kyiv. Its importance grew in 1108, after it got its main shrine - the relics of the St. Barbara, brought to Kyiv from Constantinople. Since the original cathedral was destroyed, these relics have been kept in St. Volodymyr's Cathedral in Kyiv. Although the monastery was severely damaged during the Mongolian Tatar invasion, it continued to prosper and grow, mostly due to the efforts of Polish kings and (later) Ukrainian Hetmans. 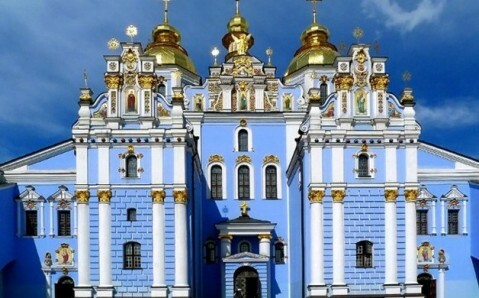 In the 16th century, St. Michael's Monastery was one of the richest cloisters in Kyiv. One century later, it was almost completely rebuilt, adding Ukrainian baroque details. St. Michael's Cathedral is famous for its unique mosaics and frescos, which are rightfully considered to be the greatest creations of the Old Russian monumental painting. Its mosaics are nicknamed ‘glimmering,’ because of their exquisiteness and shine. When the temple was completely demolished by the Soviets in 1937, the valuable mosaics were rescued. 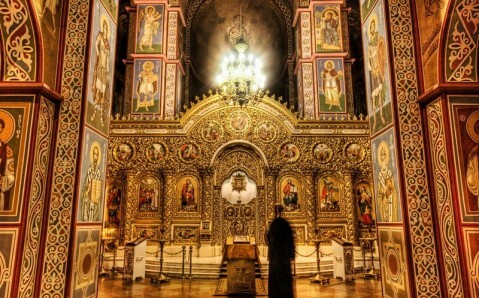 Some of them were kept in the St. Sophia Cathedral, others were taken to the Hermitage Museum in St. Petersburg and the Tretyakov Gallery in Moscow. After the cathedral’s reconstruction, all of them were returned. Today, the St. Michael's monastic complex includes, along with the rebuilt cathedral, a refectory with the Church of St. John the Divine and a bell tower, created in the 18th century. A museum dedicated to the history of the St. Michael's complex operates inside the bell tower. Its unique exhibition tells in detail about the significance and the tragic history of the cloister, along with other religious buildings in Kyiv demolished by the Bolsheviks. Fantastic views on the Ukrainian capital open up from the bell tower of the monastery. Собор красивый, но атмосфера мечетей мне ближе к душе. Giriş ücretsiz, içeri girip atmosferi görmenizi tavsiye ederim. Музей колокольня- нужно идти обязательно! 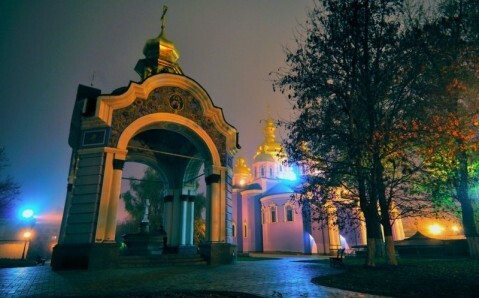 платный туалет во дворе храма. бесплатная святая вода. Сюда приходят за чудом. И само чудо здесь происходит! 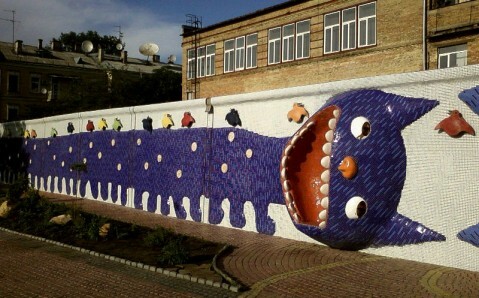 Единственная церковь, в которой мне нахамили. При входе в монастырь иконы двух покровителей один напротив другого - мой и моего брата - Андрей Первозванный и Антоний Печерский. Дуже гарна місце.Людей надиво не багато! Сейчас туда идти бессмысленно. Народу очень много. В помощи не нуждаются. Можно разве что поесть, потому что ребята наготовили больше чем нужно раненым. Слава Украине! очень много людей пришло на помощь) Слава Украине! Entrance fee: adults - 14 UAH, students - 7 UAH, small kids - free. Одно из лучших мест в Киеве. Самый лучший Собор! Величественный и красивый! Вид с колокольни на территорию монастыря, Михайловскую площадь и Софию Киевскую.